The story comes from the Rochester Post-Bulletin. 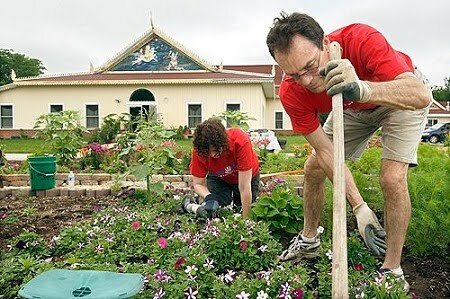 Around 25 volunteers from Carefest, an annual church-organized volunteer event, spent the day doing landscape work at the temple, which has been repeatedly targeted by vandals since it opened in 2003. Most recently, its mailbox has been damaged, shrubs destroyed, and security lights yanked from the ground. One message volunteers wanted to send was that Christians care about people of other religions: It’s an issue that’s been highlighted amid vandalism at the temple, which last year included “Jesus saves” written in spray paint on the driveway. This is a great news story. As someone who grew up subjected to the we’re-going-to-heaven-you’re-going-to-hell form of Christianity, I am always curious hear about Christian volunteers helping Buddhist institutions. As soon as I browse the title in my news feed, I’m dying to know: Why would they do this? I’m delighted to hear that they see this work as the proper Christian thing to do. On the other hand, the help that other Buddhists in Minnesota extend to the Buddhist Support Society is easily overlooked. For one, it doesn’t make good press. (Of course Buddhists want to help other Buddhists!) So I’m curious in case anyone happens to know. What have other Buddhists in Minnesota been doing to help? I’ll be more than happy to post about it. I know there have been efforts by a few members of my Zen sangha to both raise a little money for the Rochester group, and get folks to volunteer down there. I don't have any specifics on how many people have helped or given money, I just know that a call went out to all members after the last acts of vandalism occurred. I know this is a wee bit late! But that was nice to read. It's tragic that such kindness from Christians is so rare to hear about. Another thing that was striking: the people looked warm and friendly. They didn't have that You are All Festering Boils And are Going to Hell in a Bucket look about them.